If you are a student pursing a career in the Health Care profession this message is for you! 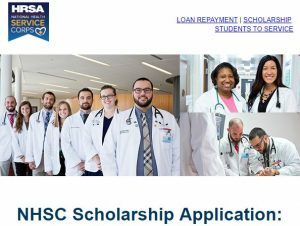 The HRSA is currently accepting applications for their National Health Service Corps Scholarship program (NHSC SP). Applying as soon as possible is highly recommended to give you the best chance of obtaining this scholarship. The deadline for this scholarship is May 16th at 7:30pm. So if you’re looking for some extra help for your tuition this scholarship may be just what you need!